The Ernakulam Central Police arrested three more persons in connection with the protest march towards the High Court by the Muslim Ekopana Samithi. 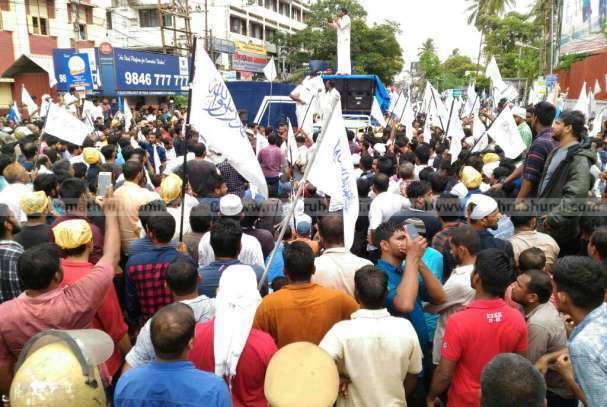 KOCHI: The Ernakulam Central Police arrested three more persons in connection with the protest march towards the High Court by the Muslim Ekopana Samithi. The arrested have been identified as Siyad, 31, of Panayappilly, Siyad, 33, of of Palluruthy and Firoz, 31 of Kochangadi. According to the officers, the trio were arrested from near the High Court on the wee hours of Wednesday. With this arrest, the number of persons arrested in the case rose to to 13. Muslim Ekopana Samithi convener V K Shoukathali and few others are yet to be nabbed, an officer said. The police had registered a case against 3,000 unidentified persons and 15 identifiable persons. The case was registered under sections 332 (voluntarily causing hurt to deter public servant from his duty) and 153A (promoting enmity between different groups). The march held on May 29, was in protest against a judgment which declared null and void the marriage of a Hindu woman, who converted to Islam.